Plaschke, Thy Sweater Is Argyle: 2000 The Simpsons Anniversary Set Pickup: Marcia Wallace Auto! 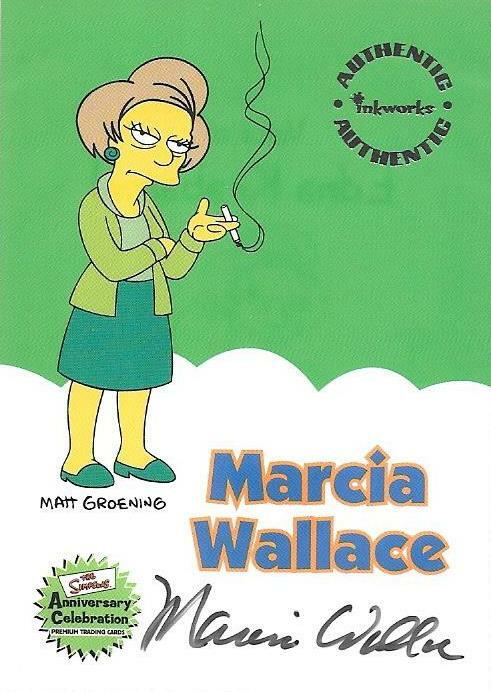 2000 The Simpsons Anniversary Set Pickup: Marcia Wallace Auto! It's tough to make any headway on either of The Simpsons autograph sets I'm currently working on. The company that released the product folded years ago and when the cards do hit eBay the ones I need tend to go for big bucks (because, of course they do). Between the 2000 and 2001 releases I need 12 total, and today's post highlights the 8th I've landed thus far. Here's my fourth of the five needed to compete the 2000 Inkworks The Simpsons Anniversary run. 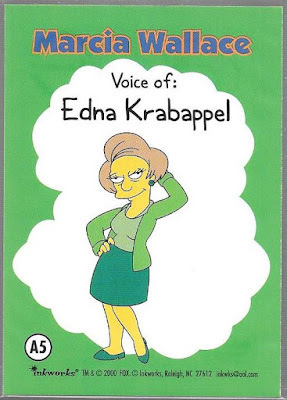 Marcia Wallace voiced Edna Krabappel, and her signature had alluded me for some time. Her passing only drove the price up whenever it did appear online but patience worked as it so often does. I was more than happy to dish out just under two blasters worth of dough. Here's the back which Inkworks always did an amazing job with. Only Nancy Cartwright remains for 2000 and then it's three more to finish off 2001 Mania (in which I need another Cartwright, and she tends to be around $100 at least). Oy.